Not to be confused with Macaronesia. This article is about the greater region of Micronesia. For the sovereign state, see Federated States of Micronesia. Micronesia (( UK: /ˌmaɪkrəˈniːziə/, US: /-ˈniːʒə/); from Greek: μικρός mikrós "small" and Greek: νῆσος nêsos "island") is a subregion of Oceania, composed of thousands of small islands in the western Pacific Ocean. It has a shared cultural history with two other island regions: Polynesia to the east and Melanesia to the south. Plus the island country of Nauru. The Caroline Islands are a widely scattered archipelago consisting of about 500 small coral islands, north of New Guinea and east of the Philippines. The Carolines consist of two states: the Federated States of Micronesia, consisting of approximately 600 islands on the eastern side of the chain with Kosrae being the most eastern and Palau consisting of 250 islands on the western side. The Gilbert Islands are a chain of sixteen atolls and coral islands, arranged in an approximate north-to-south line. In a geographical sense, the equator serves as the dividing line between the northern Gilbert Islands and the southern Gilbert Islands. The Republic of Kiribati contains all of the Gilberts, as well as the island of Tarawa, the site of the country's capital. The Mariana Islands are an arc-shaped archipelago made up by the summits of fifteen volcanic mountains. The island chain arises as a result of the western edge of the Pacific Plate moving westward and plunging downward below the Mariana plate, a region which is the most volcanically active convergent plate boundary on Earth. The Marianas were politically divided in 1898, when the United States acquired title to Guam under the Treaty of Paris, 1898, which ended the Spanish–American War. Spain then sold the remaining northerly islands to Germany in 1899. Germany lost all of her colonies at the end of World War I and the Northern Mariana Islands became a League of Nations Mandate, with Japan as the mandatory. After World War II, the islands were transferred into the United Nations Trust Territory System, with the United States as Trustee. In 1976, the Northern Mariana Islands and the United States entered into a covenant of political union under which commonwealth status was granted the Northern Mariana Islands and its residents received United States citizenship. The Marshall Islands are located north of Nauru and Kiribati, east of the Federated States of Micronesia and south of the U.S. territory of Wake Island. The islands consist of 29 low-lying atolls and 5 isolated islands,  comprising 1,156 individual islands and islets. The atolls and islands form two groups: the Ratak Chain and the Ralik Chain (meaning "sunrise" and "sunset" chains). All the islands in the chain are part of the Republic of the Marshall Islands, a presidential republic in free association with the United States. Having few natural resources, the islands' wealth is based on a service economy, as well as some fishing and agriculture. Of the 29 atolls, 24 of them are inhabited. Bikini Atoll is an atoll in the Marshall Islands. There are 23 islands in the Bikini Atoll. The islands of Bokonijien, Aerokojlol and Nam were vaporized during nuclear tests that occurred there. 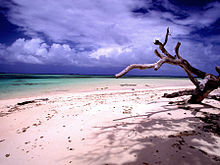 The islands are composed of low coral limestone and sand. The average elevation is only about 2.1 metres (7 ft) above low tide level. An illustration of the Cross Spikes Club  of the US Navy on Bikini Atoll, one of several Marshall Islands used for atomic bomb tests. Kili Island is one of the smallest islands in the Marshall Islands. Wake Island is a coral atoll with a coastline of 19 km (12 mi) just north of the Marshall Islands. It is an unorganized, unincorporated territory of the United States. Access to the island is restricted and all activities on the island are managed by the United States Air Force. The majority of the islands in the area are part of a coral atoll. Coral atolls begin as coral reefs that grow on the slopes of a central volcano. When the volcano sinks back down into the sea, the coral continues to grow, keeping the reef at or above water level. One exception is Pohnpei in the Federated States of Micronesia, which still has the central volcano and coral reefs around it. The region has a tropical marine climate moderated by seasonal northeast trade winds. There is little seasonal temperature variation. The dry season runs from December or January to June and the rainy season from July to November or December. Because of the location of some islands, the rainy season can sometimes include typhoons. Construction of Nan Madol, a megalithic complex made from basalt lava logs in Pohnpei began as early as 1200 CE. In the early 17th century Spain colonized Guam, the Northern Marianas and the Caroline Islands (what would later become the Federated States of Micronesia and the Republic of Palau), creating the Spanish East Indies, which was governed from the Spanish Philippines. In the Spanish–American War, Spain lost many of its remaining colonies. In the Pacific, the United States took possession of the Spanish Philippines and Guam. On January 17, 1899, the United States also took possession of unclaimed and uninhabited Wake Island. This left Spain with the remainder of the Spanish East Indies, about 6,000 tiny islands that were sparsely populated and not very productive. These islands were ungovernable after the loss of the administrative center of Manila and indefensible after the loss of two Spanish fleets in the war. The Spanish government therefore decided to sell the remaining islands to a new colonial power: the German Empire. The treaty, which was signed by Spanish Prime Minister Francisco Silvela on February 12, 1899, transferred the Caroline Islands, the Mariana Islands, Palau and other possessions to Germany. Under German control, the islands became a protectorate and were administered from German New Guinea. Nauru had already been annexed and claimed as a colony by Germany in 1888. Map from 1961 of the US Trust Territory of the Pacific Islands, formerly Japan's South Pacific Mandate. During World War I, Germany's Pacific island territories were seized and became League of Nations mandates in 1923. 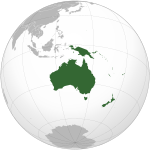 Nauru became an Australian mandate, while Germany's other territories in Micronesia were given as a mandate to Japan and were named the South Pacific Mandate. During World War II, Nauru was occupied by Japanese troops and was bypassed by the Allied advance across the Pacific. Following Japan's defeat in World War II its mandate became a United Nations Trusteeship administered by the United States as the Trust Territory of the Pacific Islands. Nauru became independent in 1968. Today, most of Micronesia are independent states, except for Guam and Wake Island, which are U.S. territories and for the U.S. Commonwealth of the Northern Mariana Islands. The Pacific Community (SPC) is a regional intergovernmental organisation whose membership includes both nations and territories in the Pacific Ocean and their metropolitan powers. Nationally, the primary income is the sale of fishing rights to foreign nations that harvest tuna using huge purse seiners. A few Japanese long liners still ply the waters. The crews aboard fishing fleets contribute little to the local economy since their ships typically set sail loaded with stores and provisions that are cheaper than local goods. Additional money comes in from government grants, mostly from the United States and the $150 million the US paid into a trust fund for reparations of residents of Bikini Atoll that had to move after nuclear testing. Few mineral deposits worth exploiting exist, except for some high-grade phosphate, especially on Nauru. Most residents of Micronesia can freely move to and work within, the United States. Relatives working in the US that send money home to relatives represent the primary source of individual income. Additional individual income comes mainly from government jobs and work within shops and restaurants. The tourist industry consists mainly of scuba divers that come to see the coral reefs, do wall dives and visit sunken ships from WWII. Major stops for scuba divers in approximate order are Palau, Chuuk, Yap and Pohnpei. Some private yacht owners visit the area for months or years at a time. However, they tend to stay mainly at ports of entry and are too few in number to be counted as a major source of income. Copra production used to be a more significant source of income, however, world prices have dropped in part to large palm plantations that are now planted in places like Borneo. There are also substantial Asian communities found across the region, most notably in the Northern Mariana Islands where they form the majority and smaller communities of Europeans who have migrated from the United States or are descendants of settlers during European colonial rule in Micronesia. It is thought that ancestors of the Carolinian people may have originally immigrated from the Asian mainland and Indonesia to Micronesia around 2,000 years ago. Their primary language is Carolinian, called Refaluwasch by native speakers, which has a total of about 5,700 speakers. The Carolinians have a matriarchal society in which respect is a very important factor in their daily lives, especially toward the matriarchs. Most Carolinians are of the Roman Catholic faith. 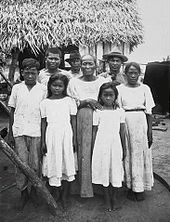 The immigration of Carolinians to Saipan began in the early 19th century, after the Spanish reduced the local population of Chamorro natives to just 3,700. They began to immigrate mostly sailing from small canoes from other islands, which a typhoon previously devastated. The Carolinians have a much darker complexion than the native Chamorros. The Chamorro people are the indigenous peoples of the Mariana Islands, which are politically divided between the United States territory of Guam and the United States Commonwealth of the Northern Mariana Islands in Micronesia. The Chamorro are commonly believed to have come from Southeast Asia at around 2000 BC. They are most closely related to other Austronesian natives to the west in the Philippines and Taiwan, as well as the Carolines to the south. The Chuukese people are an ethnic group in Oceania. They constitute 48% of the population of the Federated States of Micronesia. Their language is Chuukese. The home atoll of Chuuk is also known by the former name Truk. The origin of the Nauruan people has not yet been finally determined. It can possibly be explained by the last Malayo-Pacific human migration (c. 1200). It was probably seafaring or shipwrecked Polynesians or Melanesians, which established themselves there because there was not already an indigenous people present, whereas the Micronesians were already crossed with the Melanesians in this area. Japanese rule in Micronesia also led to Japanese people settling the islands and marrying native spouses. Kessai Note, the former president of the Marshall Islands has partial Japanese ancestry by way of his paternal grandfather, and Emanuel Mori, the former president of The Federated States of Micronesia, is descended from one of the first settlers from Japan, Koben Mori. The 2010 census results of Guam showed 7.1% were white while the 2005 census for Palau showed 8% were European. Smaller numbers at 1.9% in Palau and 1.8% in the Northern Mariana Islands were recorded as "white". In conjunction to the European communities there are large amounts of mixed Micronesians, some of which have European ancestry. The largest group of languages spoken in Micronesia are the Micronesian languages. They are in the family of Oceanic languages, part of the Austronesian language group. They are descended from the protolanguage Proto-Oceanic, which are developed from Proto-Austronesian. The languages in the Micronesian family are Marshallese, Gilbertese, Kosraean, Nauruan, as well as a large sub-family called the Trukic–Ponapeic languages containing 11 languages. There are two languages spoken that do not belong to the Oceanic languages: Chamorro in the Mariana Islands and Palauan in Palau. The cuisine of the Mariana Islands is tropical in nature, including such dishes as Kelaguen as well as many others. Palauan cuisine includes local foods such as cassava, taro, yam, potato, fish and pork. Western cuisine is favored among young Palauans. The educational systems in the nations of Micronesia vary depending on the country and there are several higher level educational institutions. The CariPac consists of institutions of higher education in Guam, the Northern Mariana Islands, American Samoa, Puerto Rico, the U.S. Virgin Islands, the Federated States of Micronesia, the Marshall Islands and Palau. The Agricultural Development in the American Pacific is a partnership of the University of Hawaii, American Samoa Community College, College of Micronesia, Northern Marianas College and the University of Guam. The public education in Guam is organized by the Guam Department of Education. Guam also has several educational institutions, such as University of Guam, Pacific Islands University and Guam Community College, There is also the Guam Public Library System and the Umatac Outdoor Library. The Northern Marianas College is a two-year community college located in the United States Commonwealth of the Northern Mariana Islands ( CNMI). The College of the Marshall Islands is a community college in the Marshall Islands. Micronesian music is influential to those living in the Micronesian islands. Some of the music is based around mythology and ancient Micronesian rituals. It covers a range of styles from traditional songs, handed down through generations, to contemporary music. Traditional beliefs suggest that the music can be presented to people in dreams and trances, rather than being written by composers themselves. Micronesian folk music is, like Polynesian music, primarily vocal-based. In the Marshall Islands, the roro is a kind of traditional chant, usually about ancient legends and performed to give guidance during navigation and strength for mothers in labour. Modern bands have blended the unique songs of each island in the country with modern music. Though drums are not generally common in Micronesian music, one-sided hourglass-shaped drums are a major part of Marshallese music. There is a traditional Marshallese dance called beet, which is influenced by Spanish folk dances. In it, men and women side-step in parallel lines. There is a kind of stick dance performed by the Jobwa, nowadays only for very special occasions. The region is home to the Micronesian Games,  a quadrennial international multi-sport event involving all Micronesia's countries and territories except Wake Island. Nauru has two national sports, weightlifting and Australian rules football. According to 2007 Australian Football League International Census figures, there are around 180 players in the Nauru senior competition and 500 players in the junior competition,  representing an overall participation rate of over 30% for the country. Micronesian mythology comprises the traditional belief systems of the people of Micronesia. There is no single belief system in the islands of Micronesia, as each island region has its own mythological beings. There are several significant figures and myths in the Federated States of Micronesia, Nauruan and Kiribati traditions. ^ a b Kirch 2001, p. 167. ^ Kirch 2001, p. 165. ^ "Geography". rmiembassyus.org. Archived from the original on 15 November 2013. ^ "Bikini Atoll Reference Facts". Retrieved 12 August 2013. ^ "Operation Crossroads: Bikini Atoll". Navy Historical Center. Department of the Navy. Archived from the original on 21 May 2000. Retrieved 4 December 2013. ^ Central Intelligence Agency (2011). "Nauru". The World Factbook. Archived from the original on 17 September 2008. Retrieved 12 February 2011. ^ a b "Background Note: Nauru". State Department Bureau of East Asian and Pacific Affairs. September 2005. Retrieved 11 May 2006. ^ Thaman, RR; Hassall, DC. "Nauru: National Environmental Management Strategy and National Environmental Action Plan" (PDF). South Pacific Regional Environment Programme. p. 234. ^ Chambers, Geoff (2013). "Genetics and the Origins of the Polynesians". John Wiley & Sons, Inc. doi: 10.1002/9780470015902.a0020808.pub2. ^ Lal 2000, p. 62. ^ Kirch 2001, p. 170. ^ The History of Mankind Archived 27 September 2013 at the Wayback Machine by Professor Friedrich Ratzel, Book II, Section A, The Races of Oceania page 165, picture of a stick chart from the Marshall Islands. MacMillan and Co., published 1896. ^ a b c Morgan, William N. (1988). Prehistoric Architecture in Micronesia. p. 30. ISBN 9780292786219. ^ Tucker, Spencer (2009). "The Encyclopedia of the Spanish-American and Philippine-American Wars: A Political, Social, and Military History". ISBN 9781851099511. ^ Rainbird 2004, p. 13-14. ^ "Geological Survey Professional Paper". ^ Rainbird 2004, p. 14. ^ Ridgell, Reilly (1995). Pacific Nations and Territories: The Islands of Micronesia, Melanesia, and Polonesia. p. 43. ISBN 9781573060011. ^ Languages of Guam Archived 23 December 2013 at the Wayback Machine. Ns.gov.gu. Retrieved on 2010-11-12. ^ Nauru. Talktalk.co.uk. Retrieved on 2010-11-12. ^ Nauru. Travelblog.org. Retrieved on 2010-11-12. ^ DOI Office of Insular Affairs (OIA) – Commonwealth of the Northern Mariana Islands Archived 9 June 2007 at the Wayback Machine. Doi.gov. Retrieved on 2010-11-12. ^ "Micronesians - Introduction, Location, Language, Folklore, Religion, Major holidays, Rites of passage". everyculture.com. ^ Kiste, Robert C.; Marshall, Mac (1999). American Anthropology in Micronesia: An Assessment. p. 1. ISBN 9780824820176. ^ C.D. Bay-Hansen (2006). FutureFish 2001: FutureFish in Century 21: The North Pacific Fisheries Tackle Asian Markets, the Can-Am Salmon Treaty, and Micronesian Seas. Trafford Publishing. p. 277. ISBN 1-55369-293-4. ^ Crocombe, R. G. (1 January 2007). "Asia in the Pacific Islands: Replacing the West". editorips@usp.ac.fj – via Google Books. ^ "Guam Ethnic groups - Demographics". indexmundi.com. ^ "Northern Mariana Islands Demographics Profile 2016". indexmundi.com. ^ "Federated States of Micronesia Ethnic groups - Demographics". indexmundi.com. ^ "Nauru Ethnic groups - Demographics". indexmundi.com. ^ "Palau Ethnic groups - Demographics". indexmundi.com. ^ Morgan, William N. (1988). Prehistoric Architecture in Micronesia. p. 3. ISBN 9780292786219. ^ Morgan, William N. (1988). Prehistoric Architecture in Micronesia. p. 2. ISBN 9780292786219. ^ "Micronesia, 1800–1900 a.d". Heilbrunn Timeline of Art History. The Metropolitan Museum of Art. 2000. Archived from the original on 1 December 2008. ^ "Micronesia, 1900 a.d.–present". Heilbrunn Timeline of Art History. The Metropolitan Museum of Art. 2000. Archived from the original on 21 May 2009. ^ "Education Profile of Micronesia, Micronesia Education, Education in Micronesia, Universities in Micronesia, Schools in Micronesia, Micronesia Education Profile". micronesiaeducation.info. Retrieved 13 October 2011. ^ Dunford, Betty; Ridgell, Reilly (1996). Pacific neighbors : the islands of Micronesia, Melanesia, and Polynesia. Honolulu, Hawaii: Bess Press. ISBN 1-57306-023-2. ^ "UNESCO Institute for Statistics". UNESCO. Retrieved 13 October 2011. ^ "Fisheries and Maritime Institute". COM-FSM website. ^ Gladwin, Thomas (1970). East Is a Big Bird. Cambridge, Massachusetts: Harvard University Press. p. 200. ISBN 0-674-22425-6. ^ Woodward, David (1998). History of Cartography. University of Chicago Press. p. 470. ISBN 0-226-90728-7. Retrieved 4 August 2010. ^ Tamanaha, Brian Z. (1993). Understanding Law in Micronesia: An Interpretive Approach to Transplanted Law. pp. 1–2. ISBN 9004097686. ^ Tamanaha, Brian Z. (1993). Understanding Law in Micronesia: An Interpretive Approach to Transplanted Law. p. 2. ISBN 9004097686. ^ a b Garland Encyclopedia of World Music (2013). The Concise Garland Encyclopedia of World Music, Volume 1. Routledge. pp. 697–706. ISBN 1136095705. ^ "Micronesian Games begin in Palau". Australian Broadcasting Corporation. 1 August 2010. Archived from the original on 15 December 2013. Retrieved 15 December 2013. ^ "Pacific Sporting Needs Assessment" (PDF). ausport.gov.au. Archived from the original (PDF) on 3 December 2007. ^ "AFL International Census 2007" (PDF). afl.com.au. Archived from the original (PDF) on 24 May 2011.